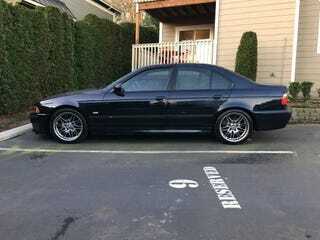 2003 E39 M5 for $16k. 165k miles on the odometer, recent work on the right sort of items, stock OEM parts. Okay, the “small dent” is bigger than small, but still. Get that sucker for like $14.5k? Maybe that dent magically pops out and/or you find a new fender? I’m just saying. Given the prices I’ve seen other E39's listed at (not sold) this seems like a fair price for well-kept car that already has cult status (and it’s only growing). Seeing some with similar mileage that are cheaper back on the east coast, but this one has reported accidents & service history at Midas (wtf, you have an e39 m5! ).